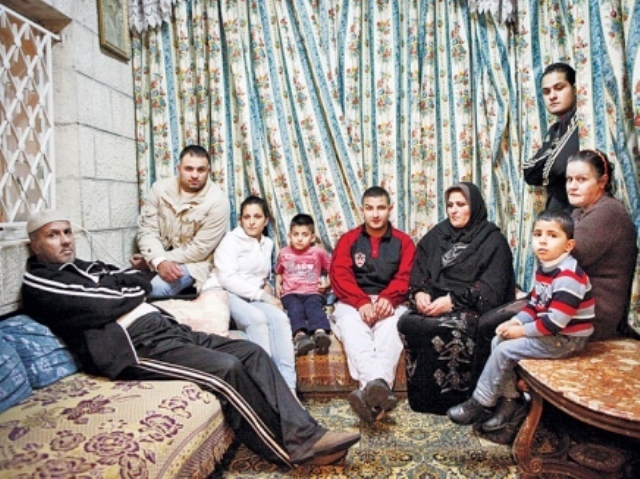 One Year After the Campaign to Stop the JNF’s Planned Eviction of the Sumarin Family in Silwan: Recollections, Reflections and Cautious Rejoicing. As we struggle against current injustices and feelings of despair, it is crucial that we remember and celebrate the victories we have achieved as a community. Exactly one year ago today, the Sumarin family was supposed to be evicted from their home in Silwan by the Jewish Naitonal Fund, working in coordination with the schemes of Judaization of Silwan espoused by the City of David’s managers, the extremist ELAD settler organization. One year later, following one of the more powerful and intense campaigns I have ever been involved in, run by folks at Rabbis for Human Rights, Solidarity, Rabbis for Human Rights-NA, the Jewish Alliance for Change, in cooperation with Palestinian activists from the Wadi Hilweh Alternative Information Center and the Sumarins themselves, the Sumarin family is still in their home and the process remains frozen. Many of us began meeting and planning different courses of action, including a massive letter campaign- both international and within Israel- to the JNF and the JNF-KKL, telling them not to evict the Sumarin family. On November 23rd, things kicked into action in earnest. A parallel, coordinated campaign was launched in the US by Rabbis for Human Rights- North America and the Jewish Alliance for Change, and yet another parallel campaign was launched in Israel by the Solidarity Movement, who also began organizing solidarity vigils at the Sumarin house, starting on the 28th, and a demonstration in Silwan/in front of ELAD’s City of David. In the UK, the Left-wing Jewish group, Yachad, picked up the call for justice and started a letter campaign of their own. (Working with both RHR and Solidarity at the time, and coordinating directly with Hagit and folks in RHR-NA, I helped organize different aspects of the campaign and wrote a piece that would serve as resource called JNF: Planting Trees or Uprooting Families). This was a complete and boldfaced lie. 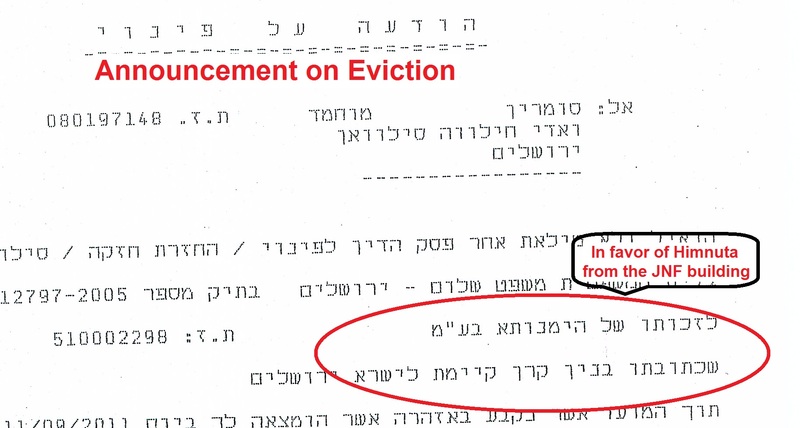 The response of KKL-JNF confirming the connection between Himnuta and ELAD, combined with additional information that we have gathered, only reinforces the fact that the KKL-JNF and its subsidiary Himnuta bear responsibility for the pending eviction of the Sumarin family, and are thus morally obligated to do everything in their power to freeze the eviction and to undo the damage that they have wrought. With December 18th as the new potential eviction date, the campaign continued. 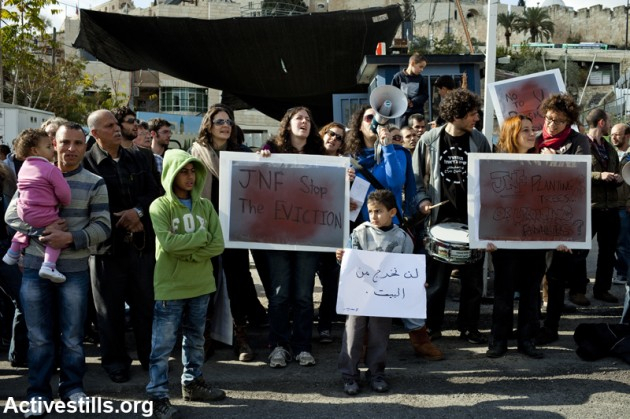 ”I hope that JNF will decide to cancel this eviction for good, and to refrain from pursuing additional such evictions. 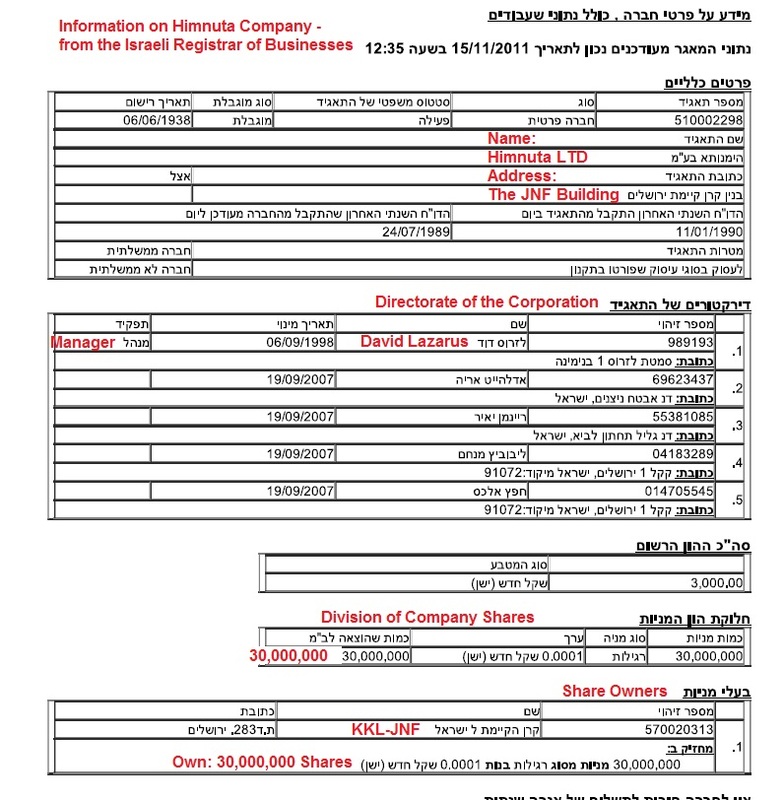 But I felt I had to resign now because senior people at JNF made clear to me that they still plan to get the Sumarin family out and transfer the property to Elad. All in all, thousands and thousands of letters were sent, dozens of Op Eds and media articles written, a number of protests, tours and solidarity vigils were held and when the December 18th eviction date was again delayed, and then the next date was delayed again, it began to become clear that the JNF did not intend to evict the Sumarin family in this round of the battle, that the de facto freeze would remain and, although the victory was not complete and the possibility of eviction still remains a reality to this day, it was a victory. We had won. The Sumarin family, the Palestinian and Israeli and international activists, the NGOs and Human Rights organizations, RHR’s voice of a Judaism that puts justice first: we had won. One year later, the family remains in their home. 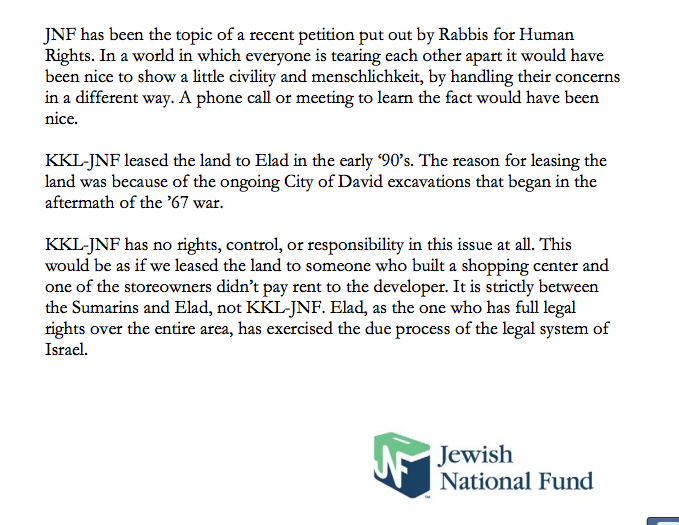 It might be the case that the campaign will need to be relaunched at some point, but we proved to the JNF, to ELAD and to the world that such injustice would not go over easily. This was an example of how cooperation, perseverance and a true orientation towards justice for all can, in some cases, win out over seemingly unshakeable, ultra-wealthy and state-supported actors who value narrow ideology over humanis, but who are susceptible to pressure like almost every corporation, government or actor in this political world. Silwan, East Jerusalem. 27 November, 2011, 2200.
of the Sumarin family is scheduled for 28 November, 2011, 0000.
of air and fire dancing in the wheelbarrow. the fire is 44 or 63, depending on how you count). Watery Coffee and Sesame Bread. I hate to get up early too. of stars and wine and 19-year old virility. because there is a tarp over the courtyard. but I was so frightened I nearly died! Everyone laughs a little bit too loud. and the sound of a truck. wither in the heat of the wheelbarrow’s hapless flames. and laugh quietly this time. meat which none of us eat: silly leftists, it’s very good! And reddish-black kettles of coffee and tea. tired: If you need anything they say just tell us. If anything happens we say just wake us. and want to stay, too. except for most of us?